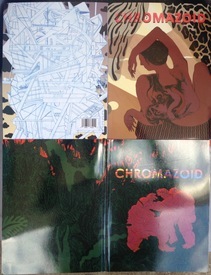 Don't miss your chance to get BOTH issues of Chromazoid for less than half the price of one! AND NOW – This set comes complete with the Chromozoid #1 Soundtrack casette tape and Chromazoid #2 Soundtrack CD!!! PLEASE NOTE: All of our copies of Chromazoid #1 are dented on the top right corner.